Idyllwild School faced a crisis. There wasn’t enough room to accommodate the anticipated enrollment of 125 kids. “Alexander’s Ragtime Band,” starring Tyronne Power, Don Ameche and Alice Faye, was luring customers to the Rustic Theatre. 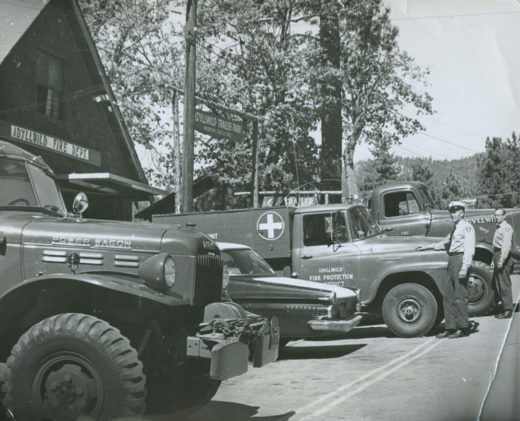 More than 100 people from Monogram Studios invaded Idyllwild to film “Northwest Mounted Police.” James Craig and Reginald Denny were in the cast. At Tahquitz Lake Estates, Tract No. 1 was substantially sold out. The developers were asking the Forest Service to help choose a location for a heliport for property owners there. An end to the long legal battle over liquor in Idyllwild seemed apparent when the Idyllwild Protection League withdrew its opposition to three licenses. Idyllwild Summer School students took a trip to the San Diego Zoo. Their guide pointed out a high fence that he said was to keep out the most dangerous of all animals, the American teenager. Another, he said, was to keep the American road hog in his place. Howard Jordan replaced Cliff Hagenbach on the Pine Cove Property Owners Association board. The Institute for Advanced Musical Studies’ deal with USC-ISOMATA (now Idyllwild Arts) to relocate to and use the local campus during the winter months fell through. The annual closure of high fire-hazard watershed areas in the San Bernardino National Forest began. The closure was coming about a month later than normal because of wet weather. Local youth formed an organization called Hobo Skates, dedicated to finding a place in Idyllwild where youth could meet and skate legally. Residents were concerned about the use of Lindane and a health hazard of using it. Lindane was a pesticide being used to treat trees for bark beetles. Hemet Unified School District was considering a $36 million bond measure. Residents were donating water to make sure the community Christmas tree, located on Jo’An’s Restaurant’s property, survived the drought and the Stage 3 water conservation. Three years and nine days after burning down, Arriba Mexican Restaurant reopened to a priest’s quiet blessing and an energetic mariachi fanfare. With 70 felony property crimes reported from Jan. 1 to Aug. 11 in Idyllwild and Pine Cove, concerned residents were rapidly convening to form Neighborhood Watch groups. Local video producers and life partners Marcia Waldorf and Jim Crawford featured Idyllwild in a national infomercial.